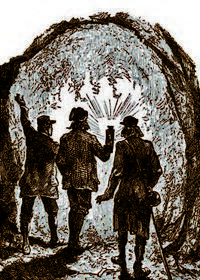 "Each fall at the annual meeting of the Geological Society of America we celebrate outstanding Earth science teachers. Pictured here are a few of them: (left) Rebekah Fuerst; (right, top to bottom) Mark Wilson, Susan Oltman, Kenneth Berger, Ann Anderson, and Blake Colaianne. For details on their accomplishments and those of other OEST, NAGT, GSA, CUR, and JGE educators of note, see pages 9-15. Reuse: This item is in the public domain and maybe reused freely without restriction. Lyman, P., & Varian, H. R., 2003: How Much Information? Summary of Findings, http://groups.ischool.berkeley.edu/archive/how-much-info-2003/. U.S. Department of Education, Office of Educational Technology, 2010, National Educational Technology Plan 2010, Transforming American education: Learning powered by technology, executive summary: http://tech.ed.gov/wp-content/uploads/2013/10/netp2010.pdf. Wallace, D.J., and Witus, A.E., 2013, Integrating iPad technology in Earth science K-12 outreach courses: Field and classroom applications: Journal of Geoscience Education, v. 61(4), p. 385-95. Geology and journalism merge in a program which provides students with experience in finding ways to remove potentially harmful logjams and promote statewide understanding of water resources. Bhattacharya, A., 2012, Nine ways scientists demonstrate they don't understand journalism: The Guardian, http://www.guardian.co.uk/science/blog/2012/jan/17/scientists-journalism/print (accessed September 2012). Iglinski, P., 2013, The 10 biggest science-reporting mistakes (and how to avoid them): The Poynter Institute, https://www.poynter.org/news/10-biggest-science-reporting-mistakes-and-how-avoid-them (accessed March 2014). Kolb, D., and Boyatzis, R., 2000, Experiential learning theory: Previous research and new directions, in Sternberg, R., and Zhang, L., eds., Perspectives on Cognitive, Learning, and Thinking Styles: New Jersey, Lawrence Erlbaum. Science should be on the journalism curriculum, 2013: The Guardian, https://www.theguardian.com/science/blog/2013/jan/11/science-on-journalism-curriculum (accessed March 2014). Twenge, J., 2013, Teaching Generation Me: Teaching of Psychology, v. 40, p. 66-69. We are very happy to congratulate the winners of a number of awards being given by NAGT, the GSA Education Division, and the Council on Undergraduate Research Geoscience Division. These awards will be officially presented at the 2015 Awards Luncheon taking place on Tuesday, November 3, 2015 during the GSA Annual Meeting. Read about all the award winners. 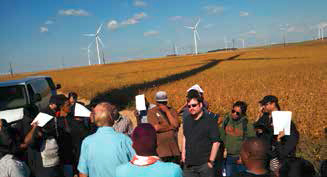 SDSU students tour a nearby wind farm. Today's geoscience education reaches beyond the traditional teaching tools such as rock samples and topographic maps. With the addition of computers in many geoscience classrooms and laboratories, faculty have unprecedented opportunity to create innovative learning experiences by bringing real-world data sets and models and simulations of geoscience processes into the classroom. 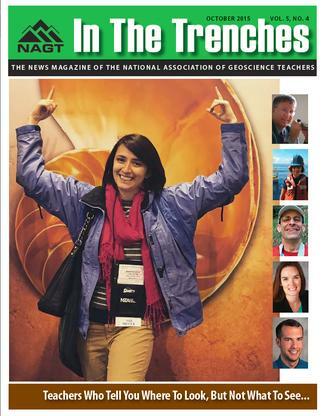 This site examines the role of geoscience departments and faculty in preparing preservice teachers and supporting practicing teachers who teach Earth science at all pre-college levels. Despite the fact that most people would agree that water is a shared resource, few think about who gets what share of fresh water. This module enables students to identify the freshwater components of the hydrologic cycle and connect them to the basic need of all human beings for equal access to clean fresh water. This 2 week InTeGrate module focuses on water and its importance to humans, both as a limited resource and in shaping Earth's surface. Student activities include using simplified physical models of complicated systems, utilizing Google Earth data and images, and working with real hydrological data sets. Interactive Lecture Demonstrations engage students in activities that confront their prior understanding of a core concept. The activity can be a classroom experiment, a survey, a simulation or an analysis of secondary data. Submit your Advertisement via the website.